Have you ever wondered if you should reinvest dividends or take them in cash and decide where to invest the money yourself? After all, a downside of reinvesting dividends in a bull market is reinvesting automatically at higher stock prices. Perhaps it makes more sense to take cash dividends and invest them only in undervalued stocks. On the other hand, reinvesting dividends allows investors to purchase fractional shares, and sometimes companies with dividend reinvestment programs offer a discount on their shares. While reinvesting dividends through a dividend reinvestment plan, or DRIP, can be great, it's not always appropriate for everyone. Let's take a look at when you should (and shouldn't) reinvest your dividends. My personal preference is to automatically reinvest dividends, particularly if you have a longer time frame (5-10+ years) and primarily own high quality companies that appear to have safe payouts. Dividend reinvestments speed up the compounding process and help shield you from the temptation of trying to time the market. If your investment horizon is long enough, continuously plowing money into the market and maintaining a hands-off approach is a proven long-term strategy to compound your wealth. But can't savvy investors take dividends in cash and identify only undervalued stocks to buy instead, further boosting their returns? As much as we'd like to believe otherwise, the fact is that we're not all Warren Buffett. Knowing what stocks to buy at any given time isn't easy, and the stock market is very efficient most of the time. In fact, over the past 15 years less than 8% of active fund managers have managed to match, much less beat, the S&P 500, according to S&P Global. It's usually very hard to accurately identify which stocks will go on to be the best long-term performers, which is one reason why we recommend equal-weighting holdings and staying well-diversified when building a dividend portfolio. 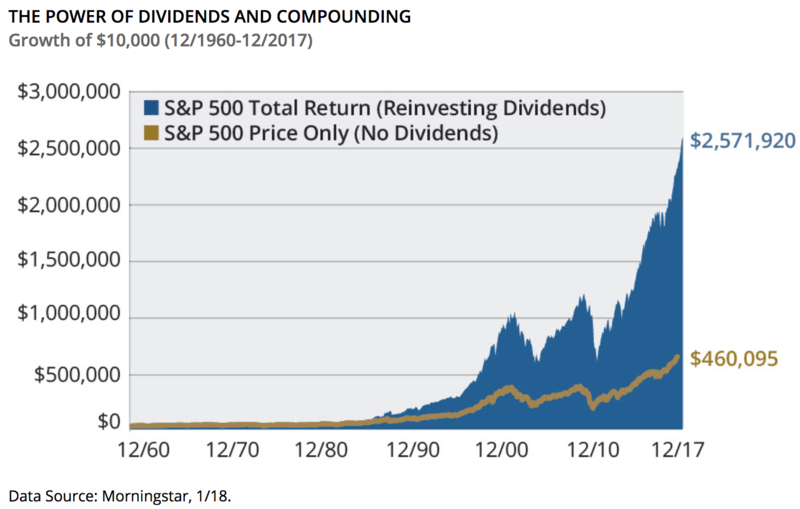 Simply put, automatically reinvesting dividends into the companies that pay them is a good way to maximize time in the market, protect against biases, and avoid getting "too cute" with portfolio management decisions. The case for a hands-off dividend reinvestment approach is also supported by the market's unpredictable short-term declines. Since 1950 the S&P 500 has experienced 26 corrections (10+% declines) and 10 bear markets (20+% declines) from past all-time highs. That’s about an average of one correction every two to three years. The average decline during the S&P 500’s corrections from all-time highs was 21%, but five of those corrections saw a loss between 30% and 60%. On average it took the market about 1.7 years to return to a new all-time high, although there were four bear markets that required investors to wait between three years and 7.5 years for a full recovery. During these market downturns, automatic dividend reinvestment is a great way to dollar cost average into ever-larger positions that will ultimately help maximize your portfolio's size, income, and future total returns. Knowing that your dividends will buy you greater numbers of lower cost (and thus higher-yielding) shares can provide a nice emotional boost, and help you avoid making costly mistakes like panic selling otherwise great companies at depressed prices. Finally, unlike when you place a buy order for a stock through your brokerage, reinvesting dividends on autopilot makes it possible to buy fractional shares, helping maximize the power of compounding. Some companies even offer a discount if you participate in their DRIP since it saves them some cash. For example, Aqua America (WTR), a water utility, allows plan participants to reinvest the cash dividends in additional shares of its stock at a 5% discount. These benefits are not possible without utilizing a dividend reinvestment plan. But while automatic dividend reinvestment is a powerful tool with many benefits, it's not always right for everyone all of the time. There are several reasons why dividend reinvestment isn't always right for everyone or every situation. The first is asset allocation, specifically the mix of cash, stocks, and bonds that best meets your individual needs. Since bear markets are inevitable, unless your portfolio is large enough to allow you to safely live entirely off dividends during retirement, many financial advisors often suggest holding enough cash to cover several years of living expenses in retirement. Maintaining a healthy cash reserve allows you to avoid selling stocks (such as under the 4% rule) during market downturns. Three or four years is usually long enough for stocks to recover to new highs. Throughout that waiting period, bonds can help serve the role of providing income, generally fall less during bear markets (they often even rise because interest rates are declining), and can potentially be sold further into a bear market to buy attractively priced stocks to rebalance a retirement portfolio. If your cash position (think of this as the emergency fund that lets you sleep well at night and stay calm during market downturns) has become depleted, say due to an unexpected medical expense, then taking your dividends in cash to replenish your reserve can be a wise idea. Whether you are retired or not, it's important to remember that the power of automatic dividend reinvestment is in growing your share count over time. While this strategy can be great for high quality companies you plan to hold forever, increasing your position in certain dividend stocks can be less ideal. Peter Lynch explained this concept well when he wrote, "Selling your winners and holding your losers is like cutting the flowers and watering the weeds." If dividends are automatically reinvested into low-quality companies with risky payouts, investors could be throwing good money after bad. As you can see, from 1972 through 2017, S&P 500 companies that cut or eliminated their dividends delivered an annual return of -0.35% with high volatility (standard deviation) while the equal-weighted S&P 500 Index gained 7.7% per year. To put it another way, it's hard to build a compelling case to invest in high-risk dividend stocks, much less decide to automatically reinvest the dividends they pay back into more shares. However, some more adventurous income investors like to carve out a small portion of their portfolio to invest in more speculative income plays. In these cases, it's very important to monitor your position size and overall diversification. Reinvesting dividends could eventually make the position larger than is desired for your personal risk management rules. Buying more shares on autopilot increases the amount of money you have at risk if things head south for the business. It might be better to take the cash dividends and invest elsewhere. Our Dividend Safety Score system identifies companies most at risk of a future dividend cut. By reviewing a firm's dividend safety, long-term investors can make better informed decisions about whether a stock is not only appropriate for their portfolios, but also an appealing candidate for automatic dividend reinvestments. Finally, valuation does matter when investing. Investors who desire to be more active with their portfolios can certainly opt to take dividends in cash in an effort to avoid buying shares of potentially overvalued stocks and manually direct the money into cheaper alternatives. Automatic dividend reinvestments are valuation agnostic, which can be less than ideal if a holding appears to be wildly overvalued. However, a well-diversified portfolio eliminates a lot of company-specific valuation risk and, as previously mentioned, the market tends to be quite efficient at pricing stocks most of the time. Building up a big enough pile of cash to invest in a potentially undervalued holding also takes time and energy while creating temptation to time the market if you're not careful. Ultimately, dividend growth investing is about achieving your long-term financial goals. While reinvesting your dividends is a powerful tool that can help you compound your income and wealth faster, it's not always appropriate for everyone or every situation. Sometimes unexpected expenses come up that might deplete your cash position and emergency fund. In the name of financial security and sleeping well during the next bear market, you might want to refresh your cash position with dividends if you don't have other income sources. In addition, while DRIPs can be a great way to automate the investment process and thus minimize the risks of making costly mistakes (protects you from yourself), automatically reinvesting your dividends back in the companies that pay them can have its own downsides. Most notably, the dividend stock may be a speculative, high-risk position that you want to keep a small part of your portfolio, if at all, for the sake of appropriate risk management. Buying more shares of excessively priced holdings is another risk factor. Overall, our preference is to assemble a portfolio of high quality dividend stocks that can be held forever, so long as their dividends remain safe and their long-term outlooks remain bright. Reinvesting dividends across the board provides growing exposure to these businesses. Sure, some of the dividend reinvestments will go back in holdings that are somewhat overvalued, but it's easier said than done to identify those situations and act on them in a consistent, profitable manner. Staying the course and maximizing time in the market are more desirable factors to help keep our dividend snowball safe and growing.